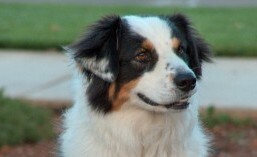 There is a cute and comely little Aussie who lives down the block. Her name is Canberra. We met on Dognet (the audio channel all dogs use to communicate with others in the neighborhood). I was immediately enchanted. We began a relationship and became inseparable. We communicated daily by howling and barking. This is easier than cell phones..no weak signals, no dead batteries, no tickets for phone use while shedding…and we learned to howl on a secure frequency. It was total bliss. Some of my friends commented that it was more than a bit strange that the love of my life was a dog I had never actually seen in the flesh (OK, hair-covered flesh). But they obviously didn’t understand that love need not follow a standard protocol. Now I am devastated. After not having heard from her in the last two weeks, I learned from local media (a busy-body, loquatious Schnauzer who lives across the street) that Canberra has been publicly saying that I had died and that I never existed. She apparently didn’t explain how my death could have preceded my presence here on earth, but she was always endearingly confused. I’ve been sending her messages, asking her if it wouldn’t have been easier to merely break off our relationship amicably and in a more conventional manner, but she is stonewalling me. To make matters worse, today I learned that she is competing in a prestigious dog competition and hoping for best in show. So, I’m left with one question: Why? Some will say she is mentally imbalanced. Some will opine that she was motivated by her quest for a victory, hoping the judges would be moved by her paramour’s passing and subsequent non-existence. I guess it doesn’t matter. Besides, I’m still in love with her. And I’m concerned for her welfare. My concern is that her inevitable victory in the dog show will cause a media examination of her use of BEDs (beauty enhancing drugs). Animal Planet will be all over it. I know she has mixed BEDs in her kibble and spiked her water dish with them. No Aussie could come by those looks naturally. And of course, I will ultimately be called to testify as a witness to her doping. Will I perjure myself to protect the object of my unrequited love, or will I adhere to my ethical principles, tell the truth, and cause her untold pain which may well lead to her own dogicide. I obviously require counseling in every conceivable area. So, it’s back to Dognet for help. Full circle. This entry was tagged Animal Plant, blog, dating, dog and love, dogs and drugs, Lance Armstrong, Manti Teo, online dating. Bookmark the permalink.